The many interconnected components of your home’s garage door system have to work closely with one another to function properly. There’s a lot of room for problems to crop up, and naturally many homeowners find it difficult to deal with a door that isn't working correctly. From broken torsion springs to dented door panels, malfunctioning openers to broken rollers - our team is here to help you handle any issue. The heavy-duty springs in your door are what do the hard work – they carry the weight each time the door gets lifted. Your springs are have a limited service life, so will weaken over time with regular use. When your door starts wobbling or sagging, this is usually a sign that the springs need to be replaced, however don’t be tempted to do this yourself. These components can be dangerous to handle yourself. Contact our technicians to arrange a replacement instead. The most complicated part of your door system is the opener - it's responsible for the automatic moving of your door. Over time the unit can develop a range of issues, from worn circuit boards and faulty wiring to damaged rails and trolleys. Luckily, our team works with every brand of opener there is, and can quickly identify what the problem is. Many of the problems that a garage door system develops happen over time. Parts wear out, lubrication runs dry, and grease and grime builds up on moving parts. Regular maintenance is essential to prevent the expense and hassle of a breakdown, and our team specializes in comprehensive maintenance services. No matter what you need, whether a replacement spring or dent removal, opener repairs to safety sensor adjustment, our team can help. 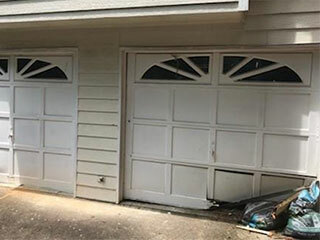 Contact Garage Door Repair Huffman today to find out what we can do for you.